Forest Hills, Queens, September 27, 2007 - We've all grown accustomed to stores who put up the Halloween decorations as soon as Labor Day is over. I think it's kind of sad - September is still summer; Halloween properly belongs to autumn - but I understand that that's how business works now. And every year it seems to get worse. My kids will be blogging about the the good old days when the Halloween season didn't begin until after the fourth of July. It's annoying enough that the stores want to get a jump-start on holidays. It's perplexing to see the impulse filtering down to the general population. 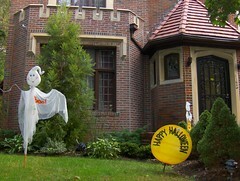 What would possess someone to put up Halloween decorations in front of their house in mid-September? Buy costumes now, if you must, before the racks are picked over, but can't we all agree to keep our lawns ghost-and-witch-free until October? What are you trying to say? I shouldn't have put up my Christmas Tree and lights yet? Please don't make me take it all down. I shall neither confirm nor deny that (yet), but I truly meant "my kids" in a completely generic way!